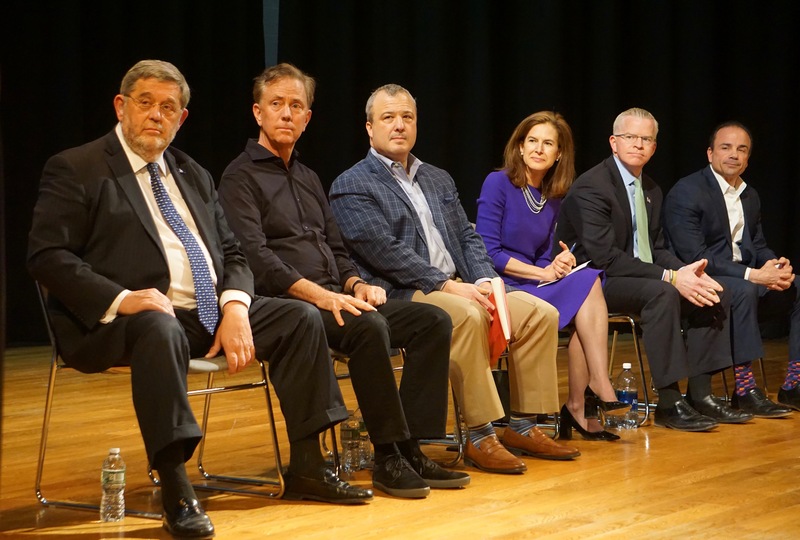 From left, Guy Smith, Ned Lamont, Jonathan Harris, Susan Bysiewicz, Sean Connolly and Joseph P. Ganim. New Haven — A sharp moment in an otherwise collegial candidate forum Sunday probably reflected the current pecking order in the crowded Democratic race for governor: Invited to challenge any rival with a question, Susan Bysiewicz targeted Ned Lamont, the decisive winner of a recent Connecticut AFL-CIO straw poll. She asked Lamont, who has opted out of the state’s voluntary system of publicly financing campaigns, if he would limit his spending before the Democratic primary to the $1.25 million allotted to candidates who qualify for a public grant. Lamont, who is financing his campaign with personal wealth and grass-roots contributions, declined to make that promise. Bysiewicz, a former secretary of the state who is trying to make a comeback eight years after leaving office and six years after losing a bitter U.S. Senate primary to Chris Murphy, was alone in accepting an invitation by Vinnie Mauro, this city’s Democratic chairman, to pose a challenging question to another candidate. Lamont had no retaliatory query for Bysiewicz. Lamont won a five-way AFL-CIO straw poll with 48 percent of the vote. Jonathan Harris, the former state senator and consumer protection commissioner, was second with 14.7 percent, followed by the former veterans affairs commissioner, Sean Connolly, with 11.4 percent. Bysiewicz was fourth with 10.9 percent. Bridgeport Mayor Joseph P. Ganim had 6.6 percent. All five plus Guy L. Smith IV, a former corporate communications executive who briefly worked for President Clinton, were on stage Sunday at Hill Regional Career High School, invited by the Democratic Town Committee of New Haven, a city central to any Democrat’s hopes of winning the nomination or the election in November. It will send the largest delegation to the state nominating convention in May and is likely to be the single largest source of Democratic votes in the November election. Four years ago, Gov. Dannel P. Malloy outpolled Republican Tom Foley in New Haven by more than a 6-1 ratio. Malloy, a Democrat seeking a second term, carried the city, 23,183 to 3,491. Bysiewicz, Harris and Connolly all intend to seek public financing. To qualify, they must raise $250,000 in contributions of no more $100 and win a spot on the primary ballot, either by winning 15 percent of the delegate vote at the convention in May or by petitioning. Lamont and Smith, a businessman seeking office for the first time, have opted out of the program. As a felon convicted of public corruption during his first stint as mayor, Ganim is barred from public financing. Lamont, Smith and Ganim can accept maximum contributions of $3,500, but Lamont is voluntarily limiting contributions to his campaign. Lamont is accepting contributions of no more than $100, the same limit applied to candidates seeking public financing. Lamont has raised $60,000 from grass-roots donors in two months, while contributing $210,000 of his own money. It’s unclear how much of his own money he is willing to spend. Lamont spent $20 million on his U.S. Senate campaign in 2006 and $9.7 million on his gubernatorial primary in 2010, much of it money he gave to his own campaigns. Ganim has raised $413,875 since becoming a declared candidate on Jan. 3, including $106,847 transferred from his exploratory campaign. 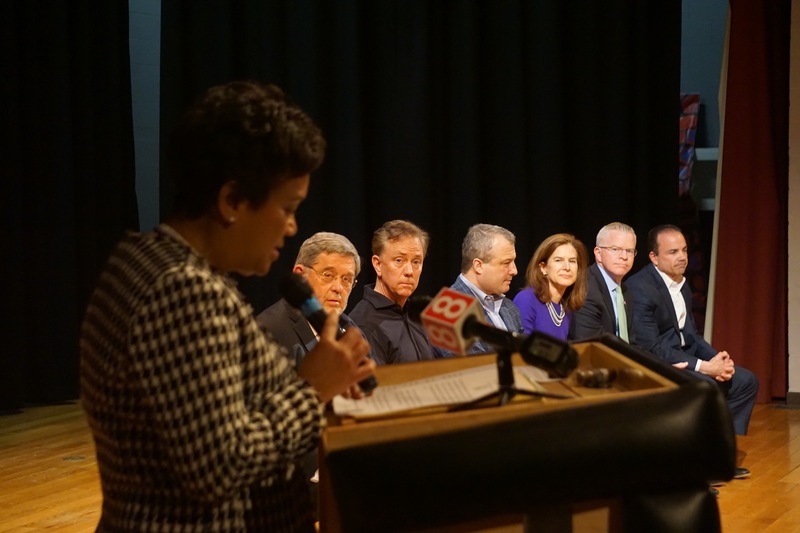 The candidates Sunday were asked what they would do differently from Malloy, a Democrat who is likely to leave office next January as one of the least popular governors in the U.S., based on recent national polling. Lamont, who competed with Malloy for the nomination in 2010, said he would be more aggressive on budget issues, but he prefaced his answer with a compliment to Malloy, who inherited a deficit of about $3.7 billion and one of the nation’s biggest unfunded pension liabilities. The audience of Democrats applauded. The candidates said the governor did well on criminal-justice reforms, eliminating homelessness, reducing gun violence and protecting the rights of the LGBT community, but most said they would offer Connecticut a different style of leadership, one that is more collaborative than combative. Mayor Toni Harp welcomes the candidates.